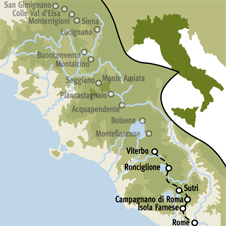 (Approach to Rome is Section 3 of '225 Miles to Rome', following the ancient Via Francigena. Sections 1 and 2 are 'Tuscan Hills' and 'Ancient Volcanic Landscapes'). Free day in Viterbo, with its fine churches, papal palace and medieval quarter. Optional walk to the Villa Lante gardens (5.3 miles, 2.5 hrs). Modern hotel on lake surrounded by Monti Cimini. Viterbo to Lake Vico: Paths through oak and chestnut forest lead to a ridge, then down to an ancient crater and Lake Vico, with its secondary cone, Monte Venere, surmounted by a small temple to Venus. We walk through hazel groves to our lake-side hotel. (9.2 miles, 4.5 hours). Comfortable hotel in the historic centre of Sutri. Lake Vico to Sutri: Tracks lead down beside a river flowing from the Lake, which powers over 20 water mills, en route to the picturesque ancient citadel of Ronciglione. Lanes then lead through hazelnut groves to the ancient walled town of Sutri, birthplace of Pontius Pilate, with its atmospheric amphitheatre, frescoed church of the Madonna del Parto, and Etruscan sites. (9.7 miles, 4.5 hours). Simple, centrally located hotel with restaurant serving traditional Italian food. Sutri to Campagnano di Roma: Follow tracks across low hills, with farmland and woods, before walking up to the gates of the walled town of Campagnano di Roma (16.9 miles, 8 hrs). Simple hotel in rural setting. Campagnano di Roma to Isola Farnese: Quiet lanes and farm tracks lead via an isolated pilgrim church to the necropolis of Etruscan Veio, then, still in unspoilt country, to the hilltop village of Isola Farnese, 11 miles from Rome (12.3 miles, 6 hours). Quietly situated near the Pantheon in central Rome. Isola Farnese to Rome: Follow the Via Cassia before passing through the nature reserves of Insugherata and Monte Mario for your first magnificent views over Rome. Then follow the Viale Angelico to reach the walls of the Vatican, and on to St. Peter’s Square. Stay at a very well-situated hotel in the centre of the old city (14.3 miles, 7 hours). Free day in Rome... with opportunities to visit the great monuments that recall successive centuries of the Romam Empire, as well as extensive art and architecture from medieval times onward. Departure day. If you would like to extend in Rome we would be pleased to book accommodation for you. The paths are varied: Etruscan roads, Roman roads, mule paths, wooded paths, cart tracks and dirt roads. On certain days the walk takes you into the hills where the paths cross a more rugged terrain that may be muddy in wet weather – please make sure that your foot-wear provides sufficient ankle support.The fitness rating for this trip is Grade 3. If you are completing all 3 sections of 225 Miles to Rome, the route is Grade 5 due to the amount of walking. Lazio’s cuisine is strong, vigorous and hearty, with plenty of oil and garlic-flavoured meat and game combinations. Grilled meat – lots of it (and large cuts!) – features heavily on menus. However, there are plenty of interesting vegetable dishes, many of them enhanced by herbs and spices. If you have walked all the way from San Gimignano, re-live your trip through wines! Savour the wines of Vernaccia di San Gimignano, Chianti (Classico and Colli Senesi), Vino Nobile di Montepulciano, Brunello di Montalcino and Est! Est!! Est!!! from Montefiascone, and Orvieto Classico. My wife and I have just completed the Approach to Rome. This was our 15th ATG holiday, more importantly, though, this was the way we both chose to celebrate 50 years of marriage. We were not disappointed. Though we are in our seventies we were still able to appreciate the sheer quality of the ATG route - still walking country lanes and staying in amazing hamlets like Isola Farnese - and only 10 miles from Rome. Since our first trip in 1997 ATG changed our approach to holidays - you started our love affair both with walking and particularly with Italy. We, and many of our close friends, owe you a huge vote of thanks (and of course thanks to Christopher Whinney's brilliant vision). We shall always be grateful. prepared with all available protection against the sun. Summer and early autumn allow for swimming in Lake Vico. In the autumn, the trees turn golden and the air is fresh with crisp mornings and clear stunning views. Temperatures can still be warm enough for shorts and T-shirts and the evenings are still balmy. 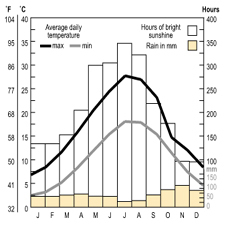 Later in the autumn, it is fresh and crisp with sunny days, colder in the evenings and with some rain. The fitness level of this trip is Grade 3. The walking is reasonably demanding: there are no free days. If you intend to walk the full 225 Miles to Rome (to include Tuscan Hills and Ancient Volcanic Landscapes), you should consider the overall Grade to be 5 (the highest level), due to the sheer volume of walking. You need stamina to complete the route all the way to Rome. Please note: The Romans rested ‘every four days’. If you plan to walk more than one section of the ‘225 Miles’ we strongly urge you to book some rest days in to your itinerary, at least between the sections. Please contact the office for advice. The paths are varied: Etruscan roads, Roman roads, mule paths, wooded paths, cart tracks and dirt roads. There are no vertiginous walks. The final walk in to Rome is (unavoidably) along a main artery (but still the Via Cassia) in to the centre. The last stretch as you enter the city over the Tiber and in to the centre is momentous. However, there are plenty of public transport options for those who would prefer to simply skip the last walk and be deposited at St Peter’s! Bus times and locations of bus stops near the route (also trains for the route in to Rome) can be provided by the Route Manager if you would like to walk only part of the way on any day. This is an 8-day trip with walks offered on 6 days. Walk lengths vary from 2.5 hours (optional walk on Day 1) to a maximum of 8 hours of walking. Hours of walking, which may vary from individual to means hours of actual walking and does not include stops for lunch, sightseeing, rests or siestas. On certain days the walk takes you into the hills where the paths cross a more rugged terrain that may be muddy in wet weather – please make sure that your foot­wear provides sufficient ankle support. The recommended destination airports for this route are Rome Fiumicino and Ciampino. From both airports there are frequent connections to central Rome (see below). If you are travelling directly to Viterbo from the airport, do not take the Leonardo Express shuttle train that runs from the airport to Roma Termini station in Rome’s city centre, but instead take the metropolitan train FL1/FM1 (left-hand rail track at the airport station) which offers regular departures (every 15 minutes, 30 minutes on public holidays) for the metropolitan stations of Rome, including Roma Ostiense (€8, journey time 32 minutes). The most frequent train service from Rome to Viterbo is that from Roma Ostiense to Viterbo Porta Romana, which runs hourly Mon-Sat and every two hours on a Sunday.The journey takes 1.5-2 hours and costs €5-€8. Please note that Porta Romana is not the principal station in Viterbo (which is called Porta Fiorentina). From Viterbo Porta Romana you will need to take a bus to Porta Fiorentina or a taxi to the first hotel. If you wish to take a taxi from this station, you will need to call ahead to your Route Manager to organise this, as there is no taxi rank at the station. There may be other services from other stations in Rome that suit your circumstances better, according to your location/plans prior to the trip. There are also some direct trains from Roma Ostiense to Porta Fiorentina but the timetable is more limited.We recommend you check options at www.trenitalia.com. There are shuttle buses to Roma Termini operated by Terravision (www.terravision.eu) and SIT (www.sitbusshuttle.com) . If you buy your ticket on line it will cost €8 return, slightly more if you buy on the bus or at the airport/ station. Buses leave regularly from outside the departures terminal, journey time 40 minutes. A taxi journey from Ciampino to Roma Ostiense (or Roma Termini, or anywhere within Rome walls) is a very reasonable (approx)€30 for up to 4 passengers. The taxi rank is outside the terminal. The closest train station to Ciampino airport is “Ciampino”, which you can reach by bus (every 30 mins; cost €1, journey 5 mins) or taxi.From Ciampino station there are very frequent train services to Roma Termini, journey time is approximately 15mins and costs €1.30. Services to the other central stations take between 45 minutes-1 hour as they are not direct. From Porta Fiorentina station in Viterbo turn L onto Viale Trento and continue to the main road. Turn R into Piazzale Gramsci which you cross and pass through the arch of Porta Fiorentina keep to the R of the piazza and turn down Via S. Faustino and almost immediately you will come to Piazzetta S. Faustino. Take the Via Cairoli downhill and you will find the hotel on your LHS. €200. A taxi from either station Porta Romana or Porta Fiorentina costs €10.Prices may alter at weekends, Bank Holidays or late at night. There is no need to dress up for dinner – ‘smart casual’ dress is acceptable in all but the smartest restaurants in Italy. If you plan to treat yourself to a meal at a special restaurant in Rome, men should bring a jacket and women a dress or skirt. The recommended airports for this trip are Rome Fiumicino and Rome Ciampino. From both airports there are frequent connections to central Rome. The most frequent onward train connections are from Roma Ostiense to Viterbo Porta Romana (hourly departures, journey time 1.5-2hrs, €5-€8). A taxi from either Rome airport to the first hotel will cost ~€180. Prices may be significantly higher on Sundays and public holidays. Taxis can be booked via the ATG office. For more detailed information on reaching the route, see Frequently Asked Questions.